Aloe juvenna, commonly known as Tiger Tooth Aloe, is an attractive and unusual succulent with up to 2 foot (60 cm) long stems. They are at first erect but later arch over and are covered from the base with bright, toothy-margined (hence the name Tiger Tooth Aloe), green leaves flecked with lighter green to white spots on inner and outer surfaces. The stems are densely stacked and tipped with a spiky tight rosette. When grown in full sun the leaves often take on reddish to brown tones. Tiger Tooth Aloe suckers profusely to make a dense stand or ground cover and can trail downwards over rocks or walls. It does not flower regularly but when it does it is in mid to late summer and is an unbranched spike with orange-red flowers. It has long been common in cultivation, but its origin was not known. The first recorded cultivated specimens were in South Africa, but although there were rumors that it had come from Kenya, its origins were a mystery even then. 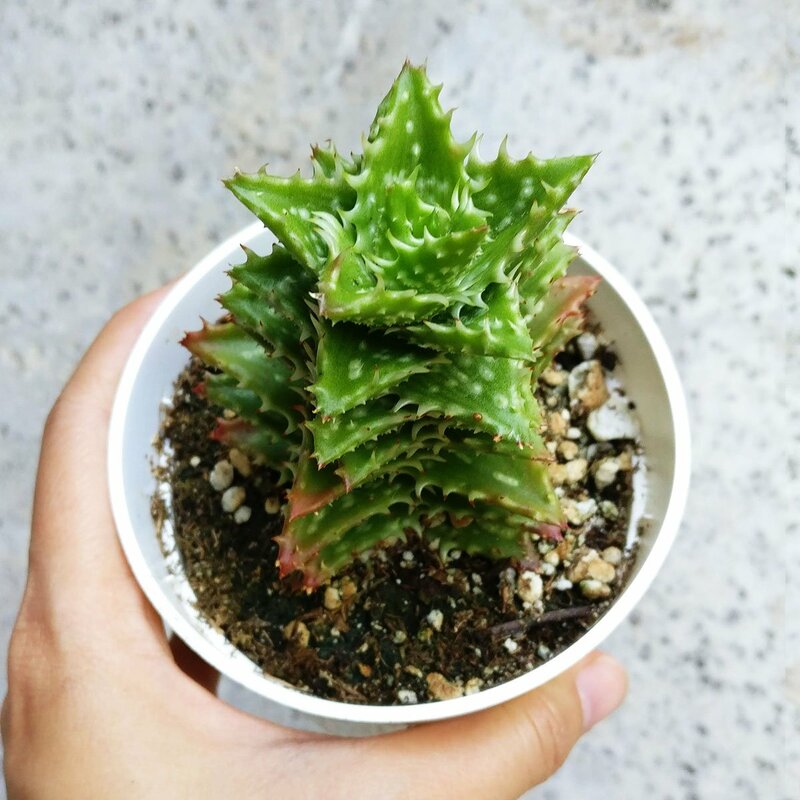 It was first believed to be a juvenile Aloe, due to its small size, and it was labelled “juvenna” (“juvenile”) for this reason. However that label eventually became its formal name. Later, it was thought to be a hybrid perhaps of Aloe distans with Haworthia coarctata or a species of Astroloba. Tiger Tooth Aloe is frequently confused with Aloe squarrosa from the island of Socotra. However Aloe squarrosa has long, smooth, spotted leaves that curve backwards. Tiger Tooth Aloe is a fine choice for the garden, but it is also a good selection for planting in outdoor pots and containers. Like all succulents, it wants soil that drains well. This succulent does great in direct or partially shaded light, so if you can, move it outside for the spring and summer. It is considered to be drought-tolerant, and thus makes an ideal choice for a low-water garden or xeriscape application. Water them sparingly. Once every week or two when the soil is completely dry is best. When in doubt, underwater. Be aware that your particular watering schedule may vary depending on its location in the room, the pot size, plant size and other conditions. When growing plants in outdoor containers and baskets, they may require more frequent waterings than they would in the yard or garden. Add a small amount of fertilizer to the new pots to encourage them to resume growth. Remove brown, dead leaves with clippers or by hand to allow room for new growth, and to maintain aesthetics. Tiger Tooth Aloe is not particularly fast-growing and will only rarely need repotting. Repot plants in the spring that are tipping over their pots or have ceased growing.